Your iPad 3 can now act as a stunningly high quality HIDPI display for a Mac or PC with the help of a great iOS app called Air Display. A completely wireless solution, Air Display takes advantage of OS X Lion and Mountain Lion HIDPI display mode to turn the new iPad’s 2048×1536 display into an ultra-crisp 1024×768 retina display. 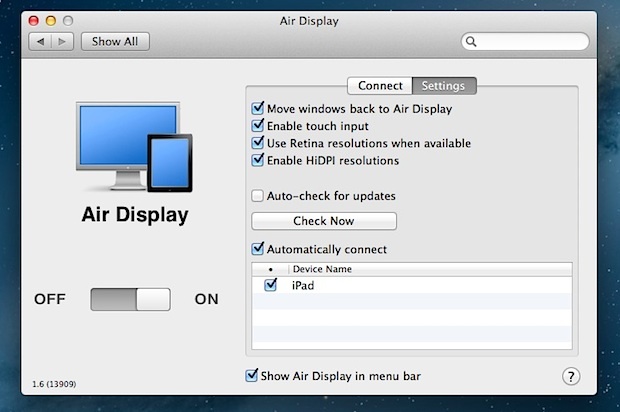 Setting up Air Display to turn that new iPad into an external retina display for a Mac is a piece of cake, be sure to meet the requirements and get started. The 15″ MacBook Pro (late 2008 and mid 2009) and 17″ MacBook Pro (early and mid 2009) are not supported due to their video cards. Other Macs should work fine, though there are some limitations with older hardware which you can read more about below. The iPad is now an amazingly crisp external display for the Mac. Drag windows over to the iPad to see just how gorgeous things are and to get a preview for what future Mac displays may look like, it really has to be seen to be believed just how nice it looks. When in HIDPI mode, the displays resolution is 1024×768 but displays extraordinarily sharp HIDPI assets and images. Air Display respects the iPads screen orientation, allowing you to use the iPad as a screen in either horizontal or vertical mode. You may want to use orientation lock to prevent the screen from rearranging itself and flickering as you move it around during initial configuration. This is a really nice app that comes highly recommended, but it won’t be a perfect solution for everyone and as I mentioned above there are some limitations. Less powerful Macs will be taxed hard by outputting to the external retina display and this makes the app not particularly practical on older hardware. In our testing, Air Display runs wonderfully on newer MacBook Pro, MacBook Air, and iMac models, but struggles on a 2010 MacBook Air where it consumed a constant 45% of CPU and spiked up to 90% CPU use when moving windows around the iPad screen. For this reason, I wouldn’t necessarily recommend Air Display for older or less powerful Macs, and Avatron would benefit from offering a limited 10 minute free trial version much like Reflection app so users can discover full compatibility before springing for the purchase. Another thing to keep in mind is that assets which aren’t optimized for the HIDPI display can look strange or display incorrectly because very few Mac apps and even parts of OS X just aren’t built for the HIDPI display yet, though this is no fault of Air Displays. Air Display also brings touch support to OS X, but you will quickly discover it’s a clunky experience due to Mac OS X not being designed for touch-based input. 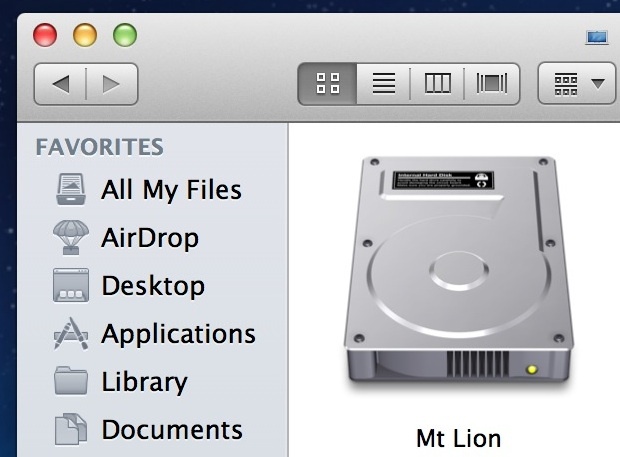 Turning a Mac into a touch device is a nice addition to the app, but it’s more fun than useful. All in all this is a quality iOS app, and if you have an iPad 3 that goes unused during the day while you work on a Mac, get Air Display and turn that iPad into an amazingly crisp external monitor. It’s a great app and well worth the $9.99. Display Pad doesnt support retina so it runs reduced at 1024×768. Air Display is nice but the performance isn’t what I was expecting, could be useful to hold iTunes windows or instant messages I guess. Works for iPhone too. Agree with the complaints about CPU use though, there has to be a better solution. I really couldn’t find a use for this, as my MacBook is attached to a second monitor (usually), but it’s super nice for when your not at your desk but need a lil’ bit of extra screen real-estate. Works perfectly on my iPad 2 and doesn’t seem to cause a lot of CPU usage. $10 for an occasional use utility app is a bit steep though.